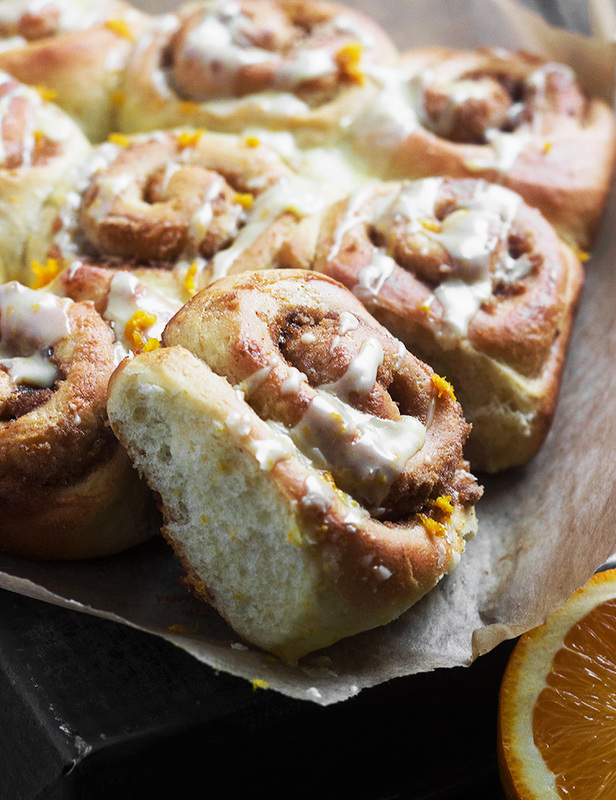 You’ll love waking up to these Orange Cinnamon Morning Rolls,. 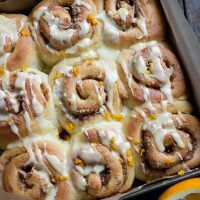 These lightly sweet rolls are filled with brown sugar, lots of cinnamon and orange zest and topped with a sweet orange drizzle. 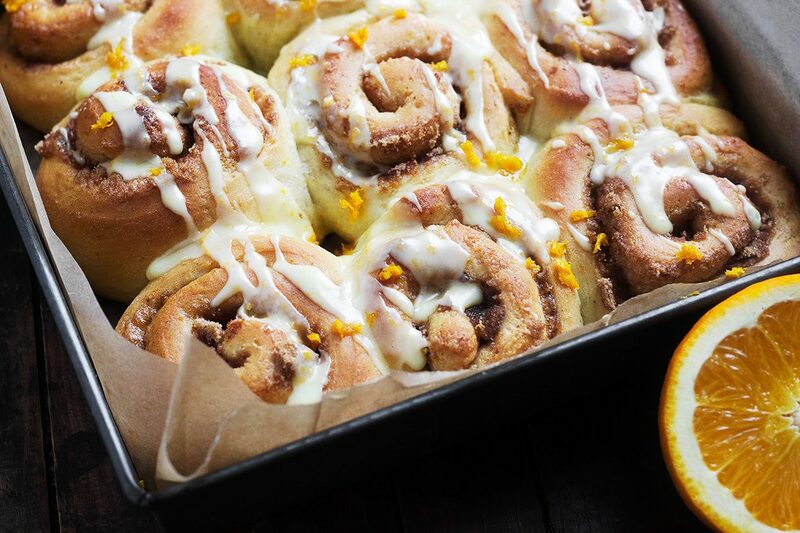 These Orange Morning Rolls are especially perfect in the morning, as they are both light and lightly sweetened. 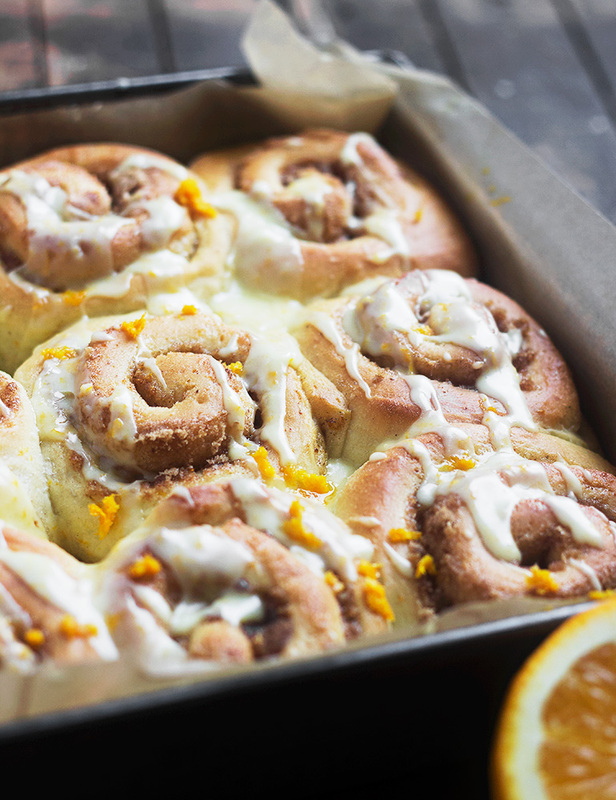 The orange flavours really shines through and the combination of orange and cinnamon is unbeatable! Who Knew? The combination of orange and cinnamon is unbeatable! This recipe doesn’t make a huge batch – just 9 small rolls, so they can be enjoyed fresh. That said, you can freeze any extras. I love to break the rolls apart and freeze in individual packages, so I can grab one from the freezer and re-warm in the microwave to enjoy later. During the winter months (well Winter here, anyway), dough can be slower to rise if your kitchen is as cool as mine is. Rising times are always just a guideline. Be sure to allow to rise until doubled, even if it takes longer than the recipe suggests. Be sure to scrub your orange well before zesting, then make use of the fresh orange juice to add to the glaze. My baking pan is 9-inch square. When you place the rolls in to the pan, it will seem like there is too much pan. Don’t worry, just space evenly, leaving space around the outside edge and allow them to rise. They will rise together! You can use an 8-inch square pan as well. Your rolls will be tighter and taller, so the baking time may be a little longer. 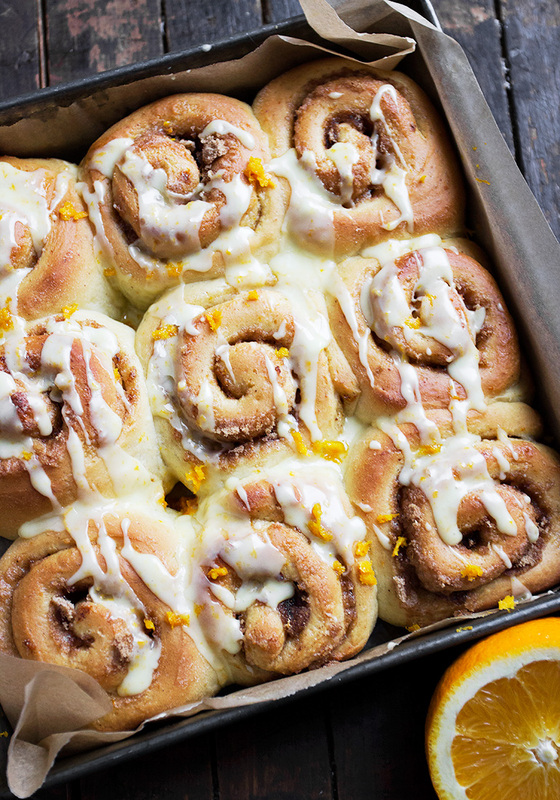 Light and lightly sweet orange and cinnamon flavoured rolls, topped with a sweet orange glaze. 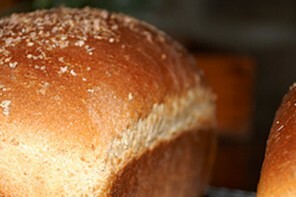 In a large bowl or the bowl of a stand mixer fitted with a kneading hook, add yeast to warm water. Stir and let stand 5 minutes, until foamy. Add sugar, milk, cooled melted butter, orange rind and vanilla. Mix to combine. Mix in egg until combined. Add 1 cup flour and mix until smooth. Begin adding additional flour in 1/4 cup increments, until dough comes together. Add additional flour in 1 tablespoon increments until you have a smooth, moist dough. Remove dough to a greased bowl. Cover and let stand until doubled, about 90 minutes. Meanwhile, in a small bowl, stir together the brown sugar and cinnamon for the filling and set aside. 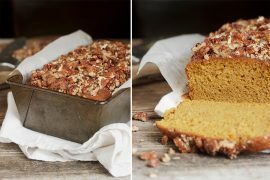 Line an 8 or 9-inch square baking pan with parchment paper and set aside. Remove dough to a well-floured work surface. Roll in to a roughly 9 x 13-inch rectangle. Sprinkle filling mixture evenly over the dough. Starting at the 9-inch wide side, roll dough up jelly-roll style and pinch seam to seal. Your roll should be 9-inches wide. Using a serrated knife, cut roll in to nine 1-inch thick rolls. Arrange rolls in prepared baking pan, in to 3 rows of 3, allowing equal space between rolls and leaving space between the rolls and the edge of the pan (about an inch). Cover pan with greased plastic wrap and set to rise until doubled, about 45 minutes (rolls should have risen to pretty much fill the pan). Preheat oven to 350 F. Remove plastic wrap and bake rolls in preheated oven for 20-25 minutes, or until golden and they sound hollow when tapped. (*If using 8-inch pan, rolls will take a bit longer. If top of rolls are browned before rolls are cooked, lightly cover top of pan with a sheet of aluminum foil to prevent further browning.) Cool rolls in pan for 5 minutes, then lift rolls out of pan using parchment paper edges. Prepare glaze by combining all the glaze ingredients and mixing until smooth. Drizzle glaze over lightly warm or cooled rolls. okay first of all I AM SO INSPIRED BY YOU. 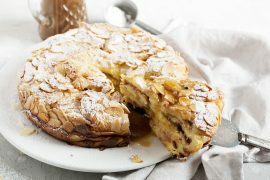 I’m a huge fan of baking – always have been, always will be. I made these this past weekend and omw omw omw omw SO GOOD. A complete hit at my house! I doubled the batch and that pan was near empty in an hour! These looks so good, I want to dive right into the pan. These would make me so happy with a cup of coffee. Hi Yuri, as written, these rolls are not dry at all, perhaps they look that way to you, but they are actually light and lovely. This type of roll – a “morning roll” is lightly sweet and a little more biscuit-like. They are intended to be served with butter. As for your current bake, I can’t really help you with your issue if you don’t make the recipe as written. Pudding mix is not something I’ve ever put in bread myself. My rule of thumb is to always try to make the recipe as written first, and then tweak if I think there is a way to improve it. Oh goodness, when I saw these on instagram the other day I almost fell out of my chair, because these look just BEYOND amazing, Jennifer!!! I’m obsessed with these! Love the orange in here and I love love love that these freeze so well! I’ll be making a triple batch.. one batch to devour now and two to have on hand in the freezer! LOVE IT! Pinned! Cheers, girlfriend! Thanks so much, Cheyanne and I think a triple-batch is definitely in order. These are delicious and would be so wonderful to have in the freezer! One of my favorite breakfast treats of all time Jennifer! Love the added orange flavor. Putting these on my list of must trys! Oh be still my heart! How I adore baking like this and now I’m fascinated with the combination of cinnamon and orange. I could seriously hurt myself on a pan of these! I would not want to share :) Absolutely beautiful photos too – have a great week Jennifer! Thanks so much Tricia and yes, you must discover this lovely flavour combination. I loved it! !